A clean slate is right here on the table in front of me. What will I set out to accomplish in this year ahead? The new year is traditionally a time to make resolutions, lists of what we will do and what we vow not to for betterment of our lives. Goals and priorities are set as we embark on "new and improved" ways of dealing with our health, home and the workplace. "Out with the old" can mean different things to each of us whether in regards to negligent eating habits, simplifying our environment or decluttering our spiritual space. As I glance through the slim January issues of my subscribed magazines, pages are saturated with white images, tips on how to "free up space and bring cool, calm order to your rooms", suggested charitable venues and ads for storage in various sizes. Painting and redecorating the family room will take priority on the list too. Where should we put the couch? Do we want to pick a slightly brighter color for the walls this time around? there will be peace in the world." Browsing through the local paper, I came across an ad for an open house this weekend, Home for the Holidays it read. So I clipped it to pin up on the calendar. Each year on the day after Thanksgiving, I pull out numerous plastic containers of holiday decorations, years of accumulated Christmas finery to adorn our home with the spirit of the season. My daughter is enthusiastically coaxing me to begin the tradition promptly as not to waste a single moment's enjoyment of the kaleidoscope lights and thought-provoking keepsakes. But today, we wanted to see something special, somewhere new and different. So the three of us hopped in the car and took a drive to Ringwood, New Jersey. Expressing gratitude may be the first purpose of Thanksgiving, but it's also the gathering that makes this holiday so well loved. It's the one time of the year when I gladly trade the quick and easy meals for hours of menu planning and preparations. Baking and cooking most of yesterday evening and today, I anticipate the arrival of family to our table sharing in a bountiful feast. Triple checking the shopping list for any last minute additions, I will still go back to the store twice more, because, like everyone, I want everything to be just so for this annual celebration. The goal, of course, is to strike the right balance of preparation and celebration, so that when loved ones gather, we can spend real time connecting. Comfort is found in making the expected favorites, like my signature Roasted Vegetable Stuffing and Pumpkin Biscotti for dessert. Mom will bring Brenna's favorite - her special Potatoes Au Gratin, and this is the time of year to try a new recipe I clipped and saved months ago. Tomorrow, it will be Party Carrots baked with fresh cream and cheese. 2)Add plenty of faith and mix well. 4)And serve everyone you meet. My daughter and her constant loving laughter and soulful lessons; my husband for his unending dedication and love; my parents for their stability and strength; and all my friends who continually bless me with their presence in my life. Each one-of-a-kind, fabulously wearable & affordable! Wish pillows, Holiday gift packages and more! For someone special... Even if that someone is you. Shhhh... Hear the scamper of those tiny little feet? Running with friends, race to the dash! Remember this night when you could be anyone? The simplest costume, the ticket to fun? Halloween is creeping closer... Dare to look into the future? Yes, the Sweetest Day is a holiday celebrated each year on the third Saturday of October. Although often regarded as a second Valentine’s Day, Sweetest Day is actually a day established to celebrate all the special people in your life. Uplifting and fun, this occasion echos an opportunity to bring someone joy and embrace the power of a smile. Founded by Cleveland candy company employee, Herbert Birch Kingston in 1922, Kingston aimed to bring cheer and happiness to the lives of those who were often forgotten. With the help of his friends, he began distributing candy and small gifts to children living in orphanages as well as those stricken with disabilities and illness. Over the years since, this novel idea of spreading cheer to the underprivileged has expanded to an occasion enabling an opportunity to remember not only the orphans, sick, aged and disabled, but those dearest to us in family and friends whose kindness and graciousness enrich our lives. Deemed an original American holiday, Sweetest Day is not based in religion, but simply a reminder that a thoughtful word, deed, or small gift enriches the life of the recipient as well as the person presenting it. Time to re-open our dining room, bringing the party inside once again, inviting guests for good food and engrossing conversation at our table. We kicked off the season with our annual apple picking excursion into New York. What fun we had! And what an impressive batch of apples we collected! One of America's most famous authors, F. Scott Fitzgerald was born on this day. His contributions to American literature, though only a mere five novels, the last of which he never completed but was published posthumously, deemed him widely regarded as one of the twentieth century's greatest writers. I can remember high school, junior year, English class... Mr. McLaughlin first introduced his work to me. 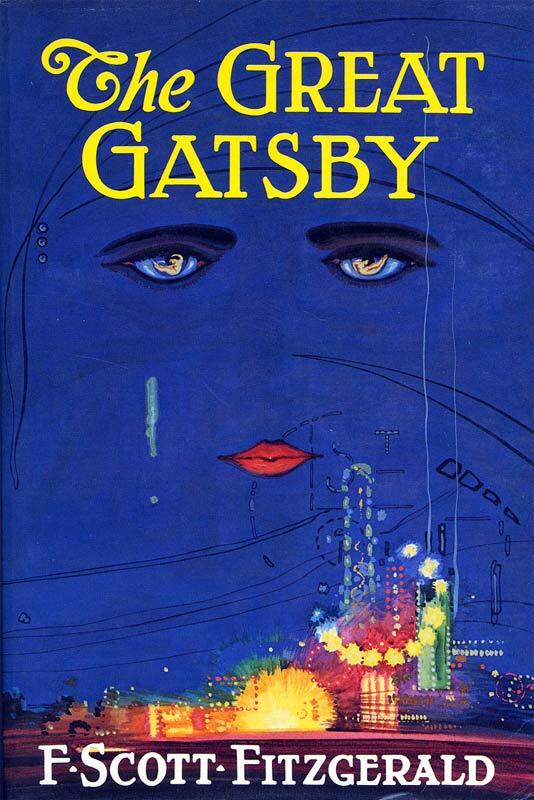 The Great Gatsby was required reading that year and I fell in love with the book from the first page. 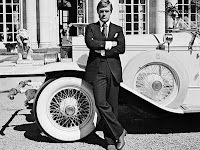 The Great Gatsby, Fitzgerald's most celebrated classic, captures all the romance and glitter of the Jazz Age. In this portrayal of a young man and his tragic search for love and success, the setting is Long Island's North Shore and New York City during the summer of 1922. Not only a rare combination of literary masterpiece and one of the most popular novels of all time, it also presents an unprecedented critique of the American Dream. In 1974, a movie of The Great Gatsby became the third filmed version of the novel which starred Robert Redford as Jay Gatsby and Mia Farrow as Daisy Buchanan. This particular rendition is my favorite memorable classic, with its stellar cast, their haunting performances and the radiant and refined costumes. 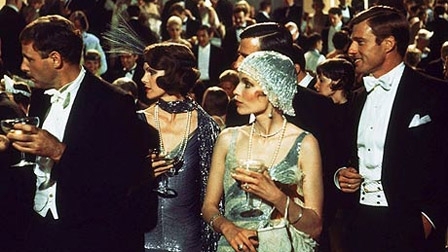 After all, it emanated the roaring Twenties, a time when fashion was at a peak hand in hand with the surge of feminism as the economy soared. 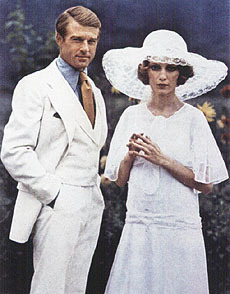 Undoubtedly, the film won an Academy Award for costume design.